Parts coming in contact with vial / aluminum cap / exposed to the atmosphere are made out of stainless steel, good housekeeping and good manufacturing practice. Sealing Pressure can be varied to suit different gauges and sizes of ROPP caps. Damage cap quantity can be reduced by adjusting the gap between Upper & Lower plate of orientation unit. Imported Gear box for Orientation unit. Imported A.C. Frequency drives for Main drive. No bottle at in-feed Machine stop. Bottle jamming at in-feed Machine stop. Bottle jamming at out-feed Machine stop. No Cap in chute Machine Stop. Door open - Machine stop. 22 MM To 65 MM MAX. 55 MM To 110 MM MAXIMUM. 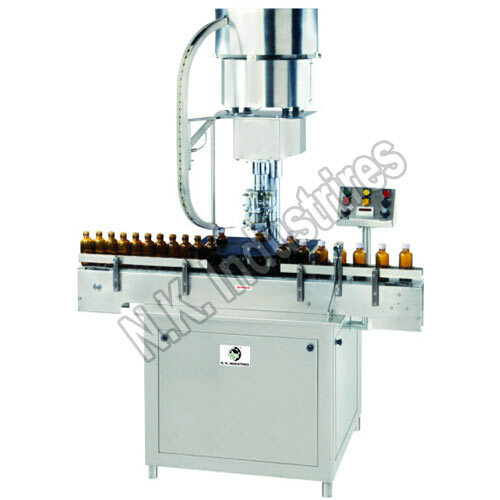 NKCS-60R Automatic Single Head ROPP Cap Sealing Machine is a compact model used for sealing of ROPP Cap on the bottle. Previously filled bottles with Dry Syrup Powder or Liquid Syrup are continuously fed from filling machine to the flat conveyor belt of sealing machine and move further through in feed worm for correct spacing between two bottles and transferred to the in feed star wheel. ROPP caps kept in orientation unit automatically orient caps in right direction before entering into delivery chute. And Bottle is entering below the sealing head, consist of total four rollers. Two rollers properly Skirts, Spins and Seals cap and simultaneously another two roller performs perfect threading according to bottle neck diameter. After sealing operation, sealing head moves upward with help of cam and bottle move with exit star wheel and Move further on conveyor belt for next operation. Acrylic Glass Safety cabinet / Toughned Glass Safety cabinet. PLC & HMI Interface as an optional.